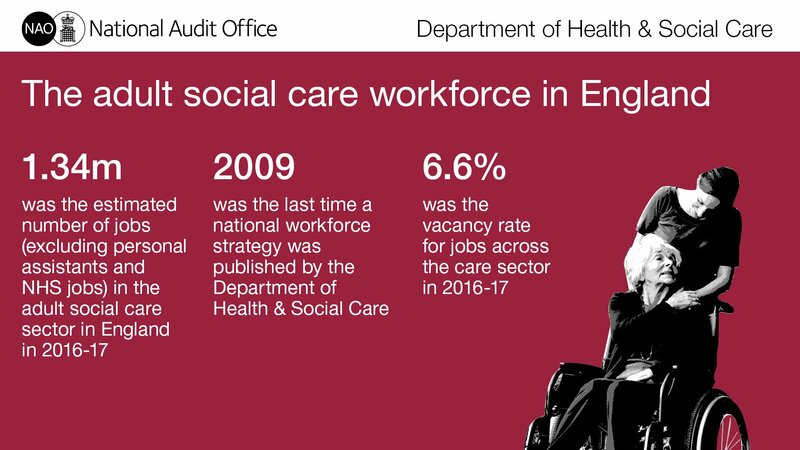 The Department of Health and Social Care is not doing enough to support a sustainable social care workforce. The number of people working in care is not meeting the country’s growing care demands and unmet care needs are increasing, according to today’s report by the National Audit Office (NAO). While many people working in care find it rewarding, there is widespread agreement that workers feel undervalued and there are limited opportunities for career progression, particularly compared with similar roles in health. In 2016-17, around half of care workers were paid £7.50 per hour or below (the National Living Wage was £7.20 in 2016-17), equivalent to £14,625 annually. This, along with tough working conditions and a poor image, prevents workers from joining and remaining in the sector. There are around 1.34 million jobs in the adult social care sector in England, across more than 20,300 organisations1. The turnover rate of care staff has been increasing since 2012-13 and in 2016-17 reached 27.8%. The vacancy rate in 2016-17 for jobs across social care was 6.6%, which was well above the national average of 2.5%-2.7%. However, demographic trends suggest that demand for care will continue to increase and people’s cares needs will continue to become more complex. To meet these challenges, the Department estimates that the workforce will need to grow by 2.6% every year until 2035. The social care market is operating in challenging circumstances. Care providers, already under financial pressures, are struggling to recruit and retain workers and are incurring additional costs as a result. Local authorities spent 5.3% less on care in 2016-17 compared with 2010-11, and spending is expected to reduce further over the next two years due to continued government funding cuts and increased financial pressures on local authorities. Uncertainty over funding is limiting local authorities’ ability to plan future spending on care. The Department cannot demonstrate that the sector is sustainably funded, which impacts workforce planning. Around 65% of independent providers’ income comes from local authority-arranged care. The vast majority of local authorities are paying fees to homecare providers that are below the recommended minimum price for care, putting providers in financial difficulties. Furthermore, local authorities are not paying the full cost for care home placements. If this continues, there is a risk providers will not continue to invest in areas where there are high proportions of people receiving local authority funded care. The Department has no national strategy to address this workforce challenge and key commitments it has made to help make the sector more attractive, through enhanced training and career development, have not been followed through. Furthermore, the NAO has not found any evidence that the Department is overseeing workforce planning by local authorities and local health and care partnerships, which commission care, to help with the challenge. Without a national strategy to align to, few local areas have detailed plans for sustaining the care workforce. The NAO has recommended that the Department produces a robust national workforce strategy with the support of the Ministry of Housing, Communities and Local Government and that it encourages local and regional bodies to align their own plans to it. The Department also needs to invest more to enable commissioners to set appropriate fees for providers, so they can pay staff adequately and afford to offer career development and training opportunities. The government intends to publish a green paper on reforming care for older people by summer 2018. 1There are around 1.34 million jobs in the adult social care sector in England. This excludes an estimated 145,000 jobs for personal assistants, employed by recipients of personal budgets and self-funders and 91,000 care jobs within the NHS. The National Audit Office scrutinises public spending for Parliament and is independent of government. The Comptroller and Auditor General (C&AG), Sir Amyas Morse KCB, is an Officer of the House of Commons and leads the NAO. The C&AG certifies the accounts of all government departments and many other public sector bodies. He has statutory authority to examine and report to Parliament on whether departments and the bodies they fund, nationally and locally, have used their resources efficiently, effectively, and with economy. The C&AG does this through a range of outputs including value for money reports on matters of public interest; investigations to establish the underlying facts in circumstances where concerns have been raised by others or observed through our wider work; landscape reviews to aid transparency and good practice guides. Our work ensures that those responsible for the use of public money are held to account and helps government to improve public services, leading to audited savings of £734 million in 2016.